There are 33 drivers entered for 32 spots, meaning that one team will miss the race. This is a significant improvement from the last few spring races at Texas, which saw 27 starters in 2014, 30 in 2015, and 28 last year (2016 was a full field of 32). Jennifer Jo Cobb Racing fields their second truck for the first time since Kansas, when Joey Gase drove to a 31st-place finish. With Gase running the XFINITY race at Michigan for Go FAS Racing, Monster Jam racer Camden Murphy takes the controls of the #0 Driven2Honor.org Chevrolet. Murphy has one Michigan start in the series, which came last August, when he drove MB Motorsports’ second truck to a 25th-place finish. Tracy Lowe’s TJL Racing isn’t entered this week, following the team’s withdrawal without a driver at Charlotte. 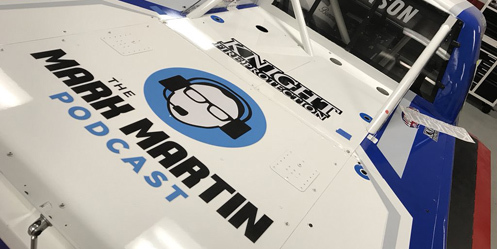 The Mark Martin Podcast has joined Jordan Anderson’s grassroots effort as sponsor, the logo on the rear decklid of the #3 Chevrolet. This is in addition to the signing of Brian Keselowski to the crew after Keselowski parted ways with Premium Motorsports last month. Sefton Steel has also signed to sponsor the quarter-panels. With John Hunter Nemechek running the XFINITY race at Michigan for Chip Ganassi Racing, father Joe Nemechek climbs aboard the #8 Romco Equipment Chevrolet. It will be Nemechek’s third Michigan start in the series following a 10th-place run in the #8 in 2014 and a 30th last August in the “start-and-park” #87, not entered this week. Bob Pockrass reported Thursday that Robby Lyons has fallen ill, and the team was now looking for a replacement driver in the #15 Chevrolet. Driving in hos place is Reed Sorenson, the team's spotter, who had also been pulled from the Premium / NY Racing Team #7 on the Cup side (see below). Kyle Busch Motorsports scales back to two trucks from three, omitting the #46 that Brandon Jones drove to a 3rd-place finish in Charlotte. Jones will continue his full-time XFINITY effort in Michigan, driving Joe Gibbs Racing’s #19 XYO Networks Toyota. With Charlotte driver Timmy Hill in Michigan for a double-duty effort (see below), Todd Peck returns to the #50 team for the first time since his last-place run in Dover. Peck has five previous Truck Series starts at Michigan with a best of 27th for SS-Green Light Racing in 2014. With Kyle Busch running double-duty in Cup and XFINITY in Michigan, the flagship KBM truck goes to Spencer Davis, who we last saw running the opening three rounds of the 2018 campaign in Daytona (finishing 7th), Atlanta (13th) and Las Vegas (13th). Davis has one Michigan start in the ARCA Racing Series last year, when he finished 9th for Bill Venturini. JBL and SiriusXM continue as sponsors. Kyle Donahue returns to attempt his third Truck Series start and first since his season-best 20th-place run for D.J. Copp Motorsports at Kansas. Donahue drives in place of J.J. Yeley, who drove the last two rounds in the NY Racing Team’s #7 Cup Series effort, but isn’t entered this week (see below). After the team withdrew in Charlotte, Clay Greenfield and his team are back in action at Texas in the #68 AMVETS / Please Stand Chevrolet. If he qualifies, it will be Greenfield’s first series start at Michigan and his team’s first start of 2018 since a strong 3rd-place start, then 22nd-place finish at Daytona. Mike Harmon’s team confirmed that Harmon will himself be driving the #74 truck, despite the driver listing being blank on the preliminary entry list. A “surprise driver” was then mentioned to drive Harmon’s XFINITY car in Michigan (see below). Ricky Benton’s #92 team isn’t entered this weekend, nor is Timothy Peters, who failed to qualify at Charlotte after a washed-out time trials. Jesse Little and JJL Motorsports are also not entered following their 16th-place performance in Charlotte. There are 40 drivers entered for 40 spots, following the withdrawal of the #28 (see below). Saturday’s stacked field of Cup regulars begins with Austin Dillon, who takes the place of Shane Lee in Richard Childress’ #3 Bass Pro Shops / Cabela’s Chevrolet. It will be Dillon’s first XFINITY Series start since Fontana, where he ran a season-best 4th. A three-team driver swap has unfolded between the teams belonging to owner-drivers B.J. McLeod and Mike Harmon. Driving the #8 this week is Floridian Caesar Bacarella, who we last saw finish 13th with the team in this year’s Daytona opener. This moves Tommy Joe Martins to the flagship #78 Chevrolet. McLeod himself will drive Harmon’s #74 Chevrolet as Harmon himself will be running Friday’s Truck Series race (see above). Penske Racing will field just one car this week – the lead #22 Menards / Richmond Ford, driven for a second-straight round by Cup regular Paul Menard – and has not entered the #12 Ford. Austin Cindric, who drove the #12 to a 4th-place finish in Pocono, moves back to the #60 Roush-Fenway Racing entry, taking the place of Chase Briscoe (who is not entered). Cindric last drove the #60 at Fontana, where he finished 28th. Race sponsor LTi Printing backs the effort, moving over from the #22. Alex Bowman eyes his first XFINITY Series start since an 8th-place finish last fall in Phoenix. This time around, he drives in place of Hendrick Motorsports teammate Chase Elliott in the #23 ISMConnect Chevrolet. Bowman’s best of three XFINITY starts at Michigan was this race two years ago – his most recent at the track – when he won the pole and finished 7th. Dylan Lupton and the #28 Fatal Clothing Ford have were withdrawn from Saturday's race. A Twitter debate followed Thursday between Lupton and team. Lupton pointed to "unfortunate circumstances" leading to him leaving the team. JGL accused Lupton's sponsors of not paying, and also volunteered that team owner James Whitener has fallen ill. JGL withdrew the #28 from Michigan to evaluate their options going forward. This continues the strange saga of JGL, which shuttered one of its teams in each of the last two years, most recently the release of Kaz Grala to Fury Race Cars LLC. The Biagi DenBeste entry returns to the circuit for the first time since Charlotte, and Cup regular Kevin Harvick will be driving it for the first time since his 19th-place performance in Texas. There are 39 drivers entered for 40 spots, the second-straight short field and 12th out of 15 this season. It is, however, two more entrants than this race last year, when only 37 took the green. Michigan sees still another twist to the #7 team. For the second-straight race, the car will be entered under Jay Robinson’s Premium Motorsports, not by Johnathan Cohen’s NY Racing Team. This time around, D.J. Kennington returns in his first start since Parker Kligerman took his place driving for the Gaunt Brothers at Charlotte. APC Executive Management signs as a sponsor. Premium’s driver Reed Sorenson was originally listed in the seat in place of J.J. Yeley. Sorenson had previously driven the #55 this year, a car withdrawn last week and not entered this week. Whether this means the #7 team will be run in place of the #55 this year, and if Cohen will again be the listed owner, is still to be determined. While Gray Gaulding will once again drive without a primary sponsor, it's worth noting the team will be running "Redwing," another variation of their black, white, and red scheme, by DC2 Designs. The car last week was driven by Cole Custer, who turned in a 26th-place finish in his second-ever Cup race last Sunday in Pocono. This week, B.J. McLeod returns to run double-duty, a driver-team pairing that wasn't revealed until Friday. As mentioned above, Premium Motorsports has not entered the #55 car this week and has placed driver Reed Sorenson in the #7. Ross Chastain remains in the flagship #15. Timmy Hill will pull double-duty this weekend, driving both the #66 O.C.R. Gaz Bar Toyota (UPDATE: Dodge) in Saturday’s XFINITY race and the #66 CrashClaimsR.US Toyota on Sunday. Hill returns to action in Cup for the fifth time this year and the first time since the Coca-Cola 600, when he finished 32nd, 17 laps down. It will be Hill’s first Cup start at Michigan since August 2015, when he finished last for Premium Motorsports. Corey LaJoie returns for his seventh start of 2018, taking the place of Cole Whitt, who ran 30th in Pocono. LaJoie ran both Michigan races last year for BK Racing with a track-best 30th in June, then a 31st in August. Zomongo has signed as primary sponsor on another new paont scheme for the #72. Garrett Smithley is set to make his Cup debut, taking the place of 34th-place Pocono finisher Derrike Cope in the #99 Chevrolet. New sponsorship has arrived from Victory Lane Quick Oil Change and Showcase Auto Sales. With this run, Smithley will join fellow JD Motorsports teammates Harrison Rhodes and Ross Chastain as drivers who have made their Cup debuts in the last two seasons. Smithley has two XFINITY starts at Michigan for JD in the “Number Nuthin,” finishing 17th in 2016 and 29th last year. The lone NASCAR last-place finish earned by a Henry J automobile occurred on November 11, 1951 at the Lakewood Speedway, a one-mile dirt track in Atlanta. The only Henry J in the 31-car field was fielded by Florida native Tommy Moon, who was then making his second start after a sterling 6th-place run one week earlier in Jacksonville. Moon’s #30 was owned by Ralph Chaney, whose dealership Chaney Motors put its logos on the car. As of this writing, Moon’s starting spot and reason out are not listed, but he is credited with finishing last as Tim Flock’s Hudson took the win.